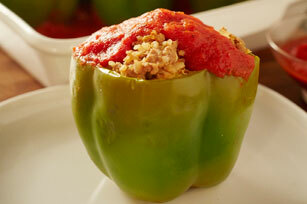 Thrill your guests with quinoa-stuffed peppers made with savory ground beef. There ain't no party like a party with Ground Beef & Quinoa-Stuffed Peppers. Mix first 5 ingredients just until blended. Cut tops off peppers; remove and discard seeds. Fill peppers with meat mixture; place in shallow baking dish. Top with pasta sauce. Bake 50 min. to 1 hour or until meat mixture is done (160ºF). Substitute cooked long-grain brown rice for the quinoa.